I’m a big believer in routine. I think that a lot of what contributes to determining whether a person succeeds or fails in their endeavors is whether or not they have a routine in place – a system – that acts as a benefit or detriment to their progress. So I was excited to find this visualization of the daily routines of 25 famously creative individuals by Podio and the one below from Infograph We Trust. Let’s take a look and see what learn from them. I’ve said before, sleep is super important. When we look at the 25 people in question the average amount of time spent per day sleeping was 7.65 hours. Of course, this is a mean and of a relatively small sample size at that so take from it what you will. 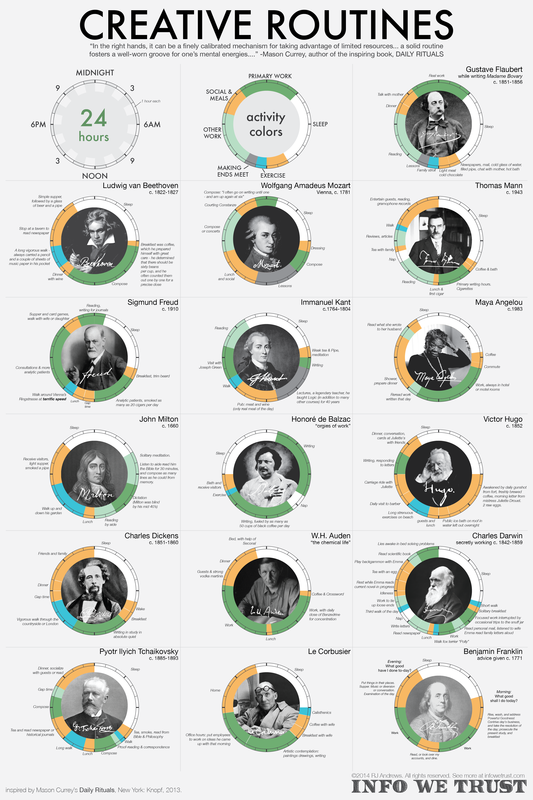 Within those 25 we have a few outliers such as poor Voltaire clocking in at only four hours of sleep per day and Mozart with a meager five. On the other end of the spectrum is Balzac with around ten hours of sleep per night. Overall though the majority fall between the seven and eight hour range. This follow pretty closely with the current general guidelines on how much sleep is considered healthy. Stepping outside the chart itself, you’ll notice a mild correlation between amount of sleep daily and lifespan – not to say this implies causation, but it’s interesting nonetheless. An important thing to take away from this for me is that to be a successfully creative it isn’t necessary to deprive yourself of sleep in the name of overzealous production. In fact, it would seem if given the option of spending more time on sleep or more time on creative work itself the individuals here at least were better off getting extra sleep rather than putting in more work hours. Quality beats quantity here, and sufficient sleep appears to be an important factor in keeping to a high standard of quality. I’d also like to note that five of our twenty five here were nappers, depending on whether you include poor insomniac Kafka or not. Napping doesn’t mean you’re lazy, and can actually be a big help in boosting your productivity and creativity. Our sample twenty five here don’t follow any apparent pattern of when they favored creative work. Some worked in the mornings immediately after waking, some worked late at night and others worked in little intermittent spurts throughout the entire day. Don’t assume just because some people say it’s better to do creative work in the mornings or evenings that it’s true for you. Experiment and find what works best for you then schedule your work times for when you feel most creative or engaged. Another thing of note is that, with the exception of Kant and his hour or so of creative work a day, the majority of the twenty five in the graphic made their creative work a priority. It wasn’t just some extra thing tacked on to their day, it was clearly a major focus for each of them. I don’t think this means that there’s any kind of magic number of work hours you have to put in on your creative endeavors, but I do think it’s strongly indicative that all these individuals were passionate about their creative work. It was a defining part of their lives, and they treated it as such. In other words, don’t phone things in. While most of these individuals lived during times when the modern concept of exercise was essentially unheard of, it’s interesting how many of them included something that could be categorized as exercise very near to when they routinely engaged in their creative work. At least fourteen of them enjoyed going for walks around when they were trying to be their most creative. If you’re feeling stuck or uncreative, try taking a short walk and letting our mind wander then coming back to things. It stands out to me that the majority of these twenty five creative individuals, though they clearly considered their creative work time an integral part of their day, weren’t chained to their desk/easel/piano/whatever. For nearly all of them their leisure time either matches or exceeds their creative time. Being fair, this does include listed mealtimes and everyone has to eat, but it’s still telling that even the most creative people around are still able to get plenty of time to relax and de-stress. For those on the list with day jobs in addition to their creative work, there always seems to be at least a small buffer of leisure time before they get into the creative stuff. I can relate to that personally. I can never go from training a client or teaching a class straight into creative work like writing, I always like to have at least a little chill out time in between as a buffer. Keep that in mind if you feel like you have to go right from your other work into that creative project you’ve been working on – you’ll probably be better off if you take a little break in-between to recharge. Out of everything, the most helpful thing to me in seeing so many famous creative individuals’ daily routines all together is that it’s a convenient reminder that we all get twenty four hours in a day. Successful people and absolute failures alike each get the same amount of time everyday – the important variable is how that time is spent. Hopefully if nothing else this has inspired you to take a look at your own daily routine to see if there are any areas where you can make adjustments to improve your creativity or well-being. If anything jumps out at you from these graphics, or you have a particular area in your daily routine you’ve recently changed and want to share it with everyone, leave a comment! Excellent post, saved those infographics to print later. I’ve just spent 5 minutes of my writing hour at 5am being distracted by this post, but I’m glad as it was a GOOD distraction, now back to that “creative” work that gets me up at 5am. Thanks! Glad it could help, or at least motivate. Good luck with your creative endeavors!